CHEN Skin Health is a natural beauty line created by Tiffany Chen. As a Tai Chi Chuan expert and martial artist, Chen wanted to create a line skin care that was free of fillers, preservatives, and synthetics. Everything is homemade and created in the heart of NYC. So, what do I think about CHEN Skin Health's Afshar serum? 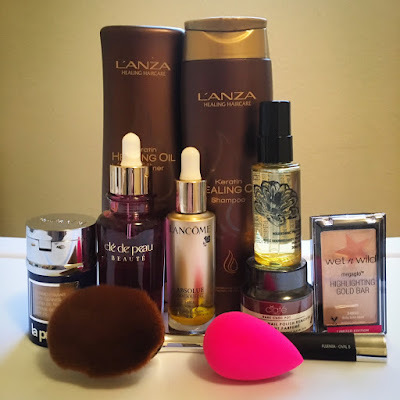 First and foremost, I love the texture of this serum, as it is outstanding. It isn't too thin yet it isn't thick. It's lightweight and sinks into your skin like a second skin, faster than most oils, serums, and creams on the market. My skin is combination, but tends to lean towards dry during the Winter and Fall months and oily during the Summer and Spring months. In short, my skin tends to be a product of my environment. The Afshar serum is one of the few products that I have used that works all year round. When it comes to regeneration, the Afshar serum works amazing as such. The rosehip oil is very evident in this serum. What I loved most about this fantastic CHEN Skin Health addition is the fact that It works incredibly to deliver intense hydration to your moisture barrier. It is also great for balancing your skin's natural pH (including acid mantle). Stimulating collagen naturally, the Afshar serum helps reduce fine lines and wrinkles. Aside from the skin, rosehip oil also works the same way with hair and nails. Sometimes our skin can become dry yet parched and other times, it can become the opposite. The Apricot oil in this product makes skin soft and smooth, without looking or feeling greasy virtually instantaneously. Spreading evenly on the skin, this is another oil that makes the Afshar serum one of the best serums I have ever used. The Red Raspberry Seed Oil in this product is a true antioxidant that is nature's cure for free radical damage, as well as, DNA damage. This essential oil adds elasticity to the skin and aids in relief to an array of problematic skin issues such as acne, eczema, and even psoriasis. And because it contains a significant amount of Vitamin A and Vitamin E, it works to correct, prevent, and even repair the skin while improving antioxidant activity. By default, Sweet Almond Oil is an anti-inflammatory, an anti-hepatotoxic, a cicatrizant, an immunity booster, a sclerosant, an emollient, and an antioxidant. Whether you have dull skin, dehydrated skin, dry skin, normal skin, combination skin, oily skin, sensitive skin, and even acne prone skin; you can benefit from this essential oil, as you can benefit from the Afshar serum. 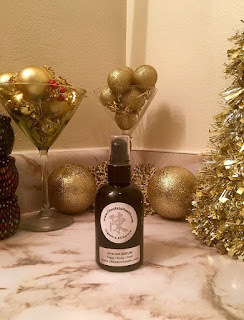 When it comes to antibacterial, the astringent functions of the Geranium oil in the Afshar serum really make this product a true healer in more ways than one. What I find fascinating about this incredible CHEN Skin Health addition is how it repairs the skin without the use of needles, drugs, or risk. This essential oil actually works to facilitate blood circulation and produce a healthy melanin flow. After using the Afshar serum for a week, I noticed that my skin was incredibly hydrated. I noticed that the quality of my skin also improved immensely, as I noticed a change in my skin's texture and tone. This product will create a vibrant yet radiant natural glow that one can not only love, but appreciate too. After using the Afshar serum for month, I noticed that my skin not only felt smooth, but looked it too. I also noticed that after using this serum, my skin has appeared more youthful. My moisture levels (including my pH levels) were more balanced. The Afshar serum works amazing as not only a regular face serum, but an eye serum too. I noticed that the skin around my eyes appeared firmer after using this amazing CHEN Skin Health addition. What I love most about this serum is the fact that it is one of the few that works to your lips hydrated. Recently, I have had issues with chapped lips, but luckily ever since using the Afshar serum, my chapped lips are gone. This works as a natural lip serum, which I love. Get ready to ditch your makeup remover, as the Afshar serum works as an incredible medium to remove makeup. 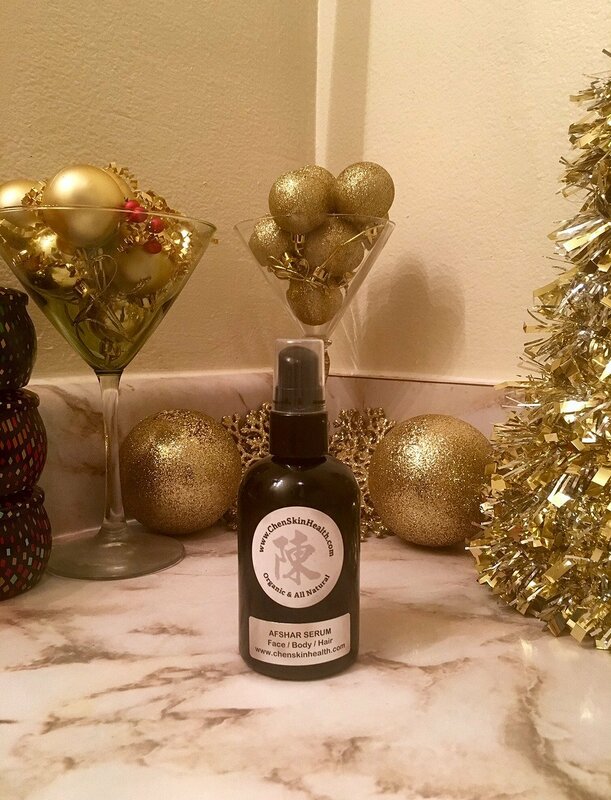 Take a few drops of this amazing serum, apply it to a cotton ball, and gently wipe across your face. You can oil pull with the Afshar serum. As all of the ingredients in this serum are antioxidants that work to boost immunity, this is also great for oral and dental health, as well. Looking for an essential oil to use with your vaginal detox? Try using the Afshar serum from CHEN Skin Health instead. All of the ingredients work together to create a plethora of all things good, great, and amazing. This product is natural and does not contain any artificial or synthetic ingredients. It is also free of sulfates, parabens, DEA, and phthalates. Considered a skin food, this organic product is also free of genetically modified organisms (or GMOs). The Afshar serum is food-grade. CHEN Skin Health embraces the cruelty-free concept and is against animal testing. No animals were harmed when the Afshar serum was created. The serum is made up of the following ingredients: Rosehip Oil, Apricot Oil, Red Raspberry Seed Oil, Sweet Almond Oil, Olive Oil, and Geranium Oil. If you are allergic to any of these ingredients, I definitely recommend refraining from using this serum. The Afshar serum is available at CHEN Skin Health for $45 (2 oz.) or $75 (4 oz.). Would I recommend this serum to a friend? Absolutely. Would I use this serum again? Absolutely. In fact, I just used some 5 minutes ago. For more information about the Afshar Serum, simply click here right now. 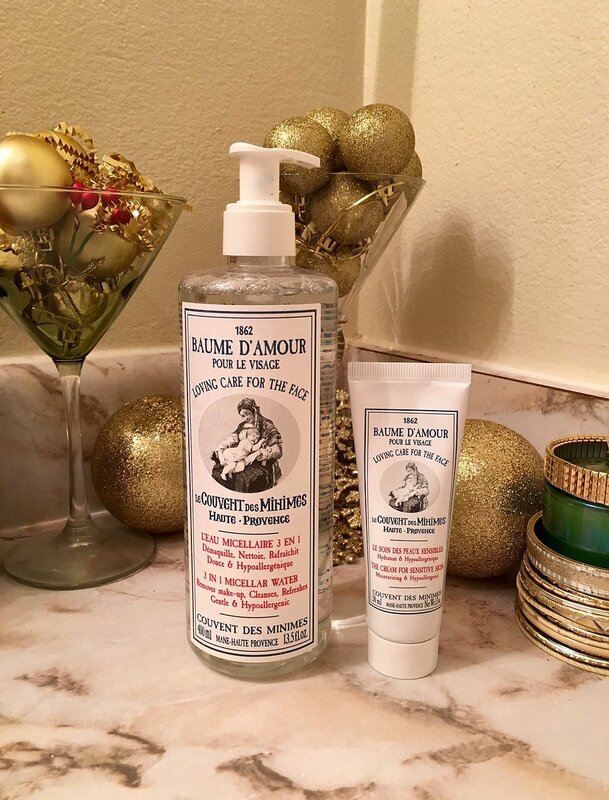 Made from the highest quality botanticals and blended according to time-honored traditions, Le Couvent des Minimes Loving Care Collection is the perfect addition to a Winter skin care regimen. Ideal for every skin type under the sun, the collection will hydrate, hedge and heal your skin, leaving it radiant and smooth. 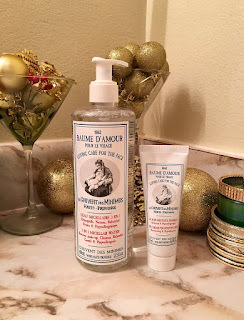 So, how can Le Couvent des Minimes help your skin this Winter season? Do you have sensitive skin? If so, you may be interested in the Face Cream for Sensitive Skin. As it works to hydrate and protect your skin, it soothes the skin. Infused with grape seed oil, mallow extract, calendula extract and rose flower water this moisturizer works to correct, prevent and even repair dry skin as well as, nourish it. For only $18, this is ideal for sensitive skin. Micellar water has an array of uses. Not only does it work to remove makeup, it works to gently cleanse the face and eye area too. It also works to refresh your skin and even set your makeup. Suitable for every skin type, Le Couvent des Minimes' 3-in-1 Micellar Water is infused with cornflower water along with mallow extract which work to refresh, tone and hydrate the skin. Available for $19, this amazing addition will meet all of your skin health needs. Do you have dry skin? Perhaps you may find the Loving Care Body Balm Lotion for Dry Skin appealing. Made with homemade Galen's wax, this hypoallergenic formula works to hydrate and nourish dry skin. Infused with calendula and mallow extract, this moisturizer works to comfort and correct cutaneous dryness. For under $40, this lotion also works to repair the skin instantaneously. It is so important to exfoliate the skin, as this will renew the skin and leave it so soft and smooth as a result. The Scrub for Dry Skin is not only a new addition to the Le Couvent des Minimes brand, but one of the most popular essentials from the Loving Care collection. This rich and very cream formula is the perfect solution to Winter dry skin. For under $30, this natural formula will gently exfoliate your skin leaving it incredibly soft. Do you have very dry skin? The Loving Care Body Balm Cream for Very Dry Skin is the perfect essential for you. Made with the in-house Galen's wax along with an epic fusion of calendula and mallow extract, this amazing hypoallergenic formula relieves, repairs and even corrects dry skin. It also works to protect and repair the skin, leaving it soft and supple. This very dry formula is available at Le Couvent des Minimes for $32. Our skin is the product of our environment and when it is cold, our skin tends to get very dry. As a result our lips are affected. One of the best solutions this Winter is Le Couvent des Minimes' Lip Balm for Dry Lips. Infused with beeswax and shea butter, this is the perfect product for your pout. For under $10, this rich formula works to correct, prevent, repair and even sooth your lips. Every year the iHeartRadio recognizes and honors the greatest talent in mainstream music. With over 200 million listeners daily, iHeartRadio reaches more people than any other radio or television outlet in the United States alone. And it is official, the iHeartRadio Music Awards will be held on Sunday, March 5th 2017 at the Historic Forum in the heart of Los Angeles. The real question is; however, who are the nominees for this year's awards? With so many talented artists out there, the dynamic duos and groups really bring something new and different to music. As a team effort is always required in a workplace environment, it is also a great thing to possess in music. With so many duos and groups, there can only be one 'Best Duo/Group of the year'. The nominees for iHeartRadio's Music Awards this year have been officially announced. So, what are they? As a genre, rock has grown immensely into magic to music. With so many sub-genres, rock remains to be one of the greatest ever. And in recent years, alternative rock has really proved this theory to be true. So, who are the nominees for Alternative Rock of the year? If you know me, you know how much I love rock music. In fact, if I had to choose a favorite genre, this would be it. When I heard about the bands nominated for this category, I was quite happy as I am fan of all of them. But the real question remains; what are the nominees for Rock Artist of the Year? Country music is a genre that brings a southern flair that can best be described in a song. With so many amazing songs to choose from, five of them really stood out this year. As Carrie Underwood shared church bells, Thomas Rhett was wearing a t-shirt. And although Cole Swindell insisted you should be here, Old Dominion asked to Snapback just before Dierks Bentley was somewhere on a beach. So, what are the nominees for Best Country Song of the year? There is literally nothing more exciting than music that makes you want to get up and just move. Dance music has been around for quite sometime and has recently evolved into something bigger, dipping heavily into mainstream. With many outstanding artists and bands within the genre, I am proud to announce the nominees for Dance Artist of the year. One thing to appreciate about the hip hop genre is it's ability to bring something different to music. Although this genre may not be your cup of tea, it could be ones' idea of a perfect drink. As a fan of the genre, it is great to see iHeartRadio recognize the best songs in the genre. So, what are they? What are the nominees for Best Hip Hop Song of the year? As we say goodbye to 2016 we fly into 2017, we just can't help but appreciate everything the year brought us. A lot of tried & true talent is one thing; however, the legendary iconic talent is another. When I look at the nominees for Best R&B Artist this year, I see so many people who bring so much to music and therefore, are legendary. So, who are the nominees for Best R&B Artist of the year? With every great artist lies a song. A song that tells more than a story. In Latin culture one thing I learned is that every song projects an emotion. An emotion so big, that it gravitates learn music. If a song is meant to be happy and exciting, it will be. If it's mean to depict sorrow and sadness, well it does that too. But the question remains; what are the nominees for Best Latin Song this year? We live in a century where Latin culture has been embraced in more ways than one. Whether it is through the people, the places, the food and the music, there are so many things one can appreciate. This year the world-renowned radio outlet recognizes some of the greatest Latin artists. So, who are they? Who is the Best Latin Artist of the year? 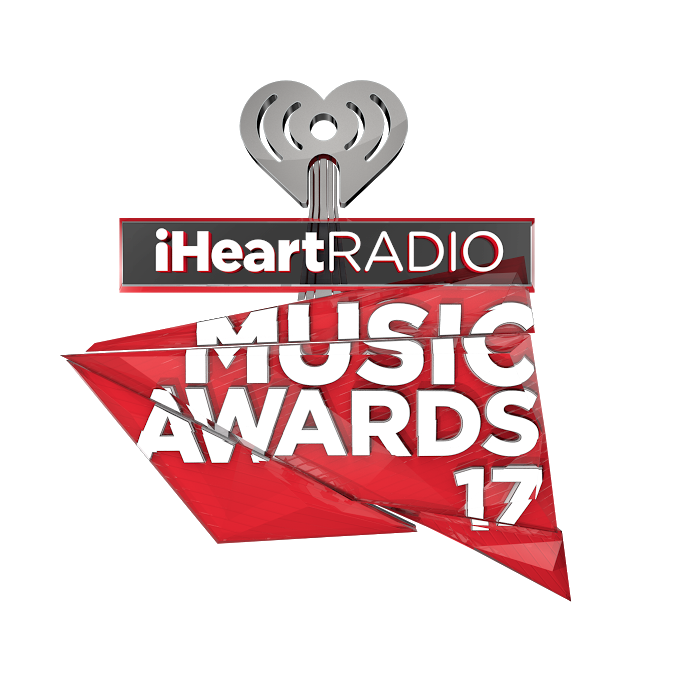 iHeartRadio has officially announced the nominees for this year's awards. Best Regional Mexican Song is a category that you may have never heard of; however, when you hear their music (especially the songs this year) you cannot help but love this genre and appreciate it too. So, what are this year's nominees? Country music is a genre to appreciate for its originality and quality. When you hear it, you know you live in a place you can call home. I think of country as the music of America, as it is musical category that originated here. With tons of country superstars today, the talent is endless. And like the other categories here, only a few can be acknowledged, recognized and honored for their gifts towards the music industry. So, who are the nominees this year? Hip Hop delivers the greatest beats with a limerick that depicts a story, a story that complements the composition. There are many artists in this category; however, only a few were recognized this year by iHeartRadio. So, who are they? Who are the nominees for 'Best New Hip Hop Artist'? Best New R&B Soul artists really bring an unique quality to music. As a crossover genre, this pop soul fusion takes you to a different world every single time you listen to it. So, who are the nominees this year? Just recently, I have garnered an interest in Latino music. Mexican artists really bring something so amazing to music. With a fusion of ethnic flavor, I am really digging the execution and deliver of these artists and as a result, am very much looking forward to hearing more. So, who are the nominees for 'Best New Regional Mexican Artist'? There are not many people in this world that can take music and turn it into something remarkable. An artist can do so much; however, we live in the 21st century where so much can be done to enhance a tune and make it that much better. A producer not only lays out the tracks, they mix and master the entire recording. And it is because of this they deserve true recognition for their efforts towards another gifted talent. So, who are the nominees this year? When a song is good, it sounds good. The composition is there. However; when a song is great, amazing or even incredible, it depicts a story that one can relate to. A story that simply makes sense. Lyrics really create something special to music. Composition is a foundation; however, without lyrics there is no story one can truly relate to. What are the nominees for 'Best Lyrics'? As another socially voted category, I think we can all agree that collaborations add something special to music. One of the things I love about music is the collaboration between two gifted talents. Whether two artists, two bands or an artist with a band and vice versus. You have to admit, it really makes you appreciate music that much more. So, who are the nominees for 'Best Collaboration' this year? So, what is your favorite music video this year? The Best New Music category is on fire this year with an array of talent lined up to take home the big award March 5th. As a new category to the awards this year, this is one that recognizes only the hottest in mainstream music today. And the best part is, you get to vote for the best. Who are the nominees this year? Who do you think will win this year?